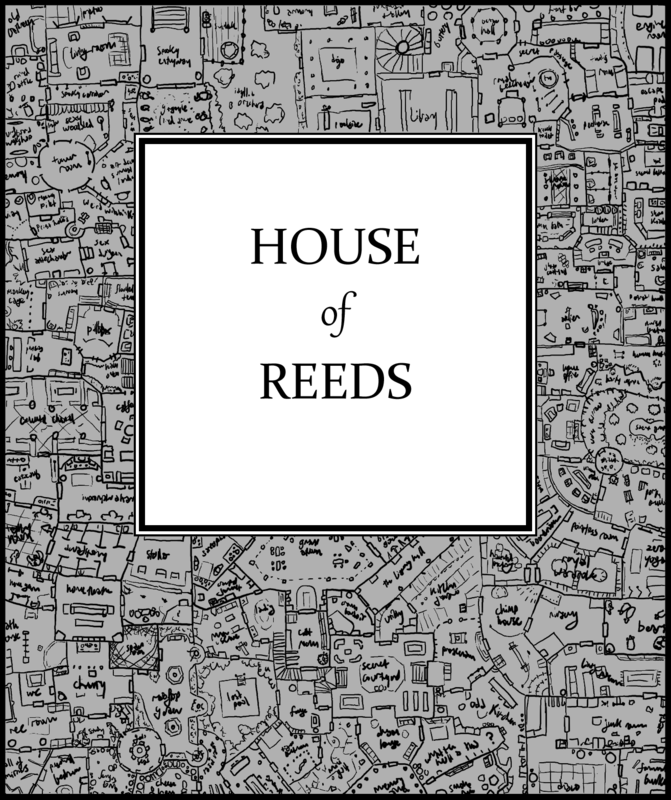 House of Reeds is a map-drawing storygame about families, for 2-6 players. It’s my first role-playing game, and it’s quite small and simple. It’s available as a free PDF download here*. It’s heavily influenced by Aaron Reed’s 18 Cadence (which I reviewed over on IFDB). ** Like 18 Cadence, House follows families over years of change, drawing on the ‘crazy uncle’s house’ parser-IF tradition of uncovering family histories through exploration of long-inhabited spaces. House can be set in almost any genre or period, wherever a family shares a home – whatever you decide either of those words mean. But it’s centred on themes that are important to me: the development of distinctive, detail-oriented, well-loved setting, and the heartache of moving away, of the absence of family and friends. I’ve lived on three different continents, for about a third of my life each; later this year I’ll be moving to a place that’s not on a continent at all. I have friends who have lived in the same city all their lives, and I can’t quite comprehend it. One of the things that’s most emotionally powerful about 18 Cadence is how abruptly it presents loss, how it avoids giving you straightforward closure. I tried to capture some of that in House. * If you’d find it more useful in some other format, let me know. I sort of twitch at the PDF format, but it’s the standard in storygames, where the idea is usually to print things out for convenience at the table. ** The original title of House was Infinite Cadence, but that’s kind of a big opaque pile of game-naming cliché. This entry was posted in storygames and tagged house of reeds. Bookmark the permalink. I’m looking forward to playing it! Hey Antonio. House of Reeds is licensed under CC-BY-SA, which means that you don’t need permission to translate, remix, or otherwise adapt it, as long as you give credit and issue the adaptations under the same license. Personally, I’d be delighted to see translations of the game; let me know when you release it! individual index cards, so they can be shuffled about.” That because during the game there isn’t a rule about shuffle the characters cards and doing something after that. I think could be a good idea to change the phrase so it doesn’t trick you to think that at some point during the game you should shuffle characters cards. Second: When you talk about the player’s turn you talk about three different action that the player does “In no particular order”. However, from what i’ve seen at my table, i think it could be interesting to set the actions order in the same way you wrote them down in the rulebook because using that particular order make you to think more from the point of view of the house, instead of the point of view of the family. Third: While playing at the table me and my group came up with a question: Can family members depart or die only when you draw a “Departure Card”, or they actually can die or depart as a result of a fiction played out in a scene from other cards? Fourth: I was a little confused at the first moment by the Reshuffle mechanics. The rulebook never directly explains how it works so we played by reshuffle all the deck except from the last drew card. Is it correct? Thanks for the detailed feedback; this is very helpful. 1) is just sloppy wording, and a straightforward fix; thanks for pointing that out. 2) I have considered this in the past, but the sticking point is the something-about-the-room-is-different step: sometimes it come as a powerful element of scene-setting, but just as often it’s a consequence of something that happens during the scene, a permanent reminder. 4) You shuffle the whole deck, including the card you just drew. I’ll clarify that. we’re playing your amazing game – thanks to Antonio’s translation. We love it so much! I have a question about how to narrate a scene. For me it’s not clear if I have to narrate a scene on my own or can I ask for help to the other players. For example, may I ask to another player to play a character (pc or npc) in a scene? Or I have to narrate scene in third person without roleplaying (like happens for example in The Quiet Year)? You use the term “narrate” and there’s no indications about, for example, assigning characters to other players at the beginning of a scene. It was intended to be like The Quiet Year. It’s my fault that it’s unclear: I wasn’t thinking about how the meaning of ‘narration’ in storygames has a more specific sense than the general meaning. In some games, and in the circles I play storygames, a ‘narrated scene’ is one where a single player says what happens and the others offer little or no input – but that’s not obvious just from the name! Mea culpa. In this kind of games sometimes you can find “grey areas” that can give you the possibility to play in a way or another. This is the reason why I ask you. Now it’s clear and I will play like you said.